Presumably directed at ultra-Orthodox Jews traveling to Manhattan for work, the billboard is sponsored by an organization called the Congregation of Yad Moshe, which appears to have ties to New York State Assemblyman Dov Hikind. Now you wake up? The billboard is down already for a week. Only to be replaced with 5 different Lipa poses. They should have such posters also on the subway. They are right. As someone (a woman) who spends a lot of time in Manhattan usually not be choice, I see disgusting things definitely not by choice. You have to look at the sidewalk sometimes! Excellent idea! Brilliant! One of the best community services ever!!!! I am proud to be a frum jew!!!!!!! Next should be a sign that being honest is a minhag, maybe that will cause people to be straight! Does anyone know the definition of chilul hashem anymore? The world is a dangerous place so are we supposed to live blindfolded? And tomorrow we'll find out that Congregation Yad Moshe has commercial real estate interests in Brooklyn . . . (or maybe not, but this doesn't smell right). I did not see the sign anymore on Friday. Why is VIN posting this so late? The Bill Boars is down already for 5 days? Brooklyn's no place for a frum Jew either. Maybe the sign is referring to the internet? No where on that billboard does it say Manhattan. Am I missing something? whoever posted that sign paid (lots of $$$$) for it so who cares? we live in a free country and ad agencies are alive and well. I think they should post unkosher also on the mikva and on the toilets in Rodney street. He might be wrong in regard to catching AIDS, but he is absolutely correct that gay waiters are abhorrent, and make patrons uncomfortable. homophobia is an invented term.it's meant to cast as evil those who feel homosexuality is wrong. i suppose that makes the torah homophobic. The goyim can't read the sign. so it just looks like an add to them. all those people who think that such a billboard is good or normal ought to move to the amish country. live without running water and electricity, without cars, cell phones , etc...i'll take manhattan! Why should another person's private life, and his/her (as perceived by another person), be of concern to you or to anyone else? The waiter is there to serve your food - nothing more and nothing less. Get over your own inadequacies. People should spend their money any way they want. Why their next sign might include a warning about the danger to young children posed by some frum men in Brooklyn. 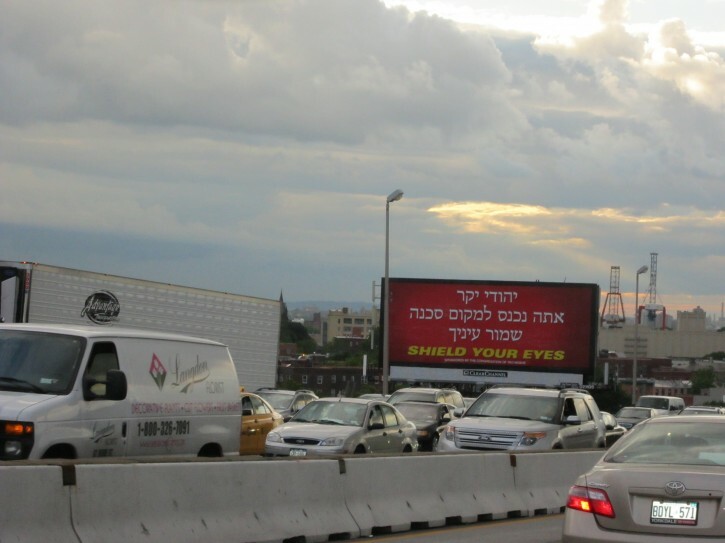 Does anyone else see the irony of posting "shield your eyes" on a billboard adjoining a busy highway? I prefer that people keep their eyes on the road when they are behind the wheel. I wish that ANY and ALL billboards along busy roads could be prohibited so as to not cause drivers to take their eyes off the road to read a catchy advertising slogan. It only takes a minute for tragedy to happen. As far as "dangerous" Manhattan is concerned, I commuted into the city five days a week for twenty five years and despite all that went on, I'm still frum after all these years!!! If one's inner character is strong, nothing outside can affect it. Yet, they all go to Walmart in Monticello which is at least as bad. “ Why should another person's private life, and his/her (as perceived by another person), be of concern to you or to anyone else? there has been a long and vast campaign by the liberal media to change our perception of homosexuality anf those who oppose it. obviously you are among those millions upon whom this campign has sadly succeeded. Some commentators here are outright apikorsim. The Torah forbids staring at immodest dressed women and considers homosexuality a capital offense. I dont understand what any of this has to do with Dov Hikind. Why does the article bother mentioning him at all?? Can someone please explain the connection? So true, And there ought to be one pointing out the issurim of a gay lifestyle---and maybe that, too, will cause people to be straight. Because, as we all know, spending tens of thousands of dollars on simplistic billboards has a major effect on everyone’s actions and hashkafos. "there has been a long and vast campaign by the liberal media to change our perception of homosexuality anf those who oppose it." Just keep making up idiotic facts that your fellow racists and homophobes are more than glad to buy into! We need to make use of the billboards. We need sighns sponsored by frum yidden against gays,evolution and other such issues. Also if the secular Israeli government seeks to draft yeshiva boys in August, let's campaighn here against them. We frum yidden can outvote any supporters of Israel if they refuse to pressure Israel to stop harrassing the frummer in Israel. I think I will speak to some wealthy askunim here in Boro park for ad money.